This David Hunt Lighting Utility large pendant ceiling light in matt black offers vintage industrial style factory lighting. Circular ceiling mount, cream braided flex suspension and domed 44cm metal shade embossed with the iconic David Hunt logo. The shade has a gloss white inner for a bright downward spread of light and there is an optional chrome metal cage available. This trendy industrial style pendant is handmade in Britain and will brighten up any cafe bar, restaurant, home kitchen or dining area. It adds character and visual impact wherever it’s fitted and looks fantastic installed in clusters. 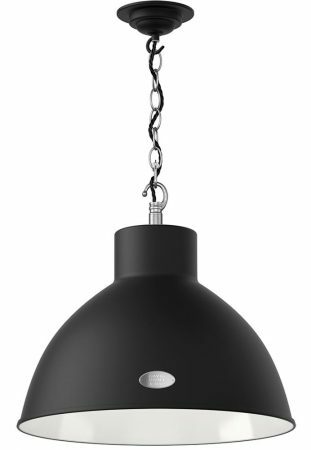 Part of the Utility pendant collection which includes small and large sized pendants in different finishes. The complete collection is available on our website, please enter the term Utility at the top of this page to view. Also available in bespoke colours, please contact us for this option. A class 2 double insulated ceiling light, no earth required and suitable for older homes without an earth loop. Height adjustable at the time of fitting, please see the technical information below for dimensions. Please note: This fitting is made and hand finished to order, please allow 5 – 7 working days for delivery. This industrial ceiling light is designed and handmade in Britain by David Hunt Lighting who are well known for the design and manufacture of original hand crafted products such as the Utility large pendant ceiling light in matt black you see here.